Spend more time working and less time chasing down payments. ePayments are great for helping you run your business more efficiently. Offering clients an online payment option with their invoices means you see money in your bank account faster, and spend less time collecting and depositing cash and checks. Cash flow win! From a customer service perspective, ePayments put you in good favor with your clients. You’re giving them a payment option that’s much more convenient than running to the bank to take out cash, mailing in a check, or even sending an e-transfer from their bank account. By making it easier to pay on time, you’ll also nag them less. More time available for positive tasks! Jobber Payments is another way Jobber can help you organize your business, allowing you to spend more time on work that matters. Available to all Jobber users in the United States and Canada—at no monthly fee and with a competitive payment processing rate—Jobber Payments is easy to set up and helps you get paid faster. 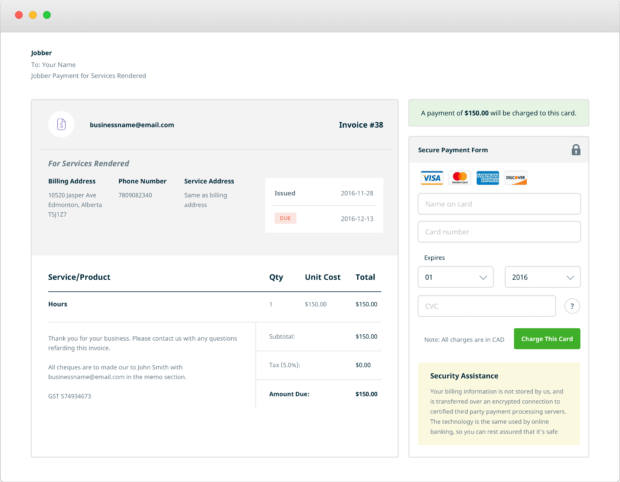 Collect payments in the field through the Jobber mobile app, and include Jobber Payments when you email your customers an invoice. In your account settings, select Jobber Payments from your side navigation, and fill out the required information. Boom! You can now start getting paid faster. Check out our help articles for more setup information, and to learn how to use Jobber Payments’ other functions. Editor’s note: this post has been updated for clarity and accuracy of information.